In my quest to learn more about my Pennsylvania German heritage, the examination of fraktur has helped me gain a clearer understanding of my ancestors and their contemporaries. 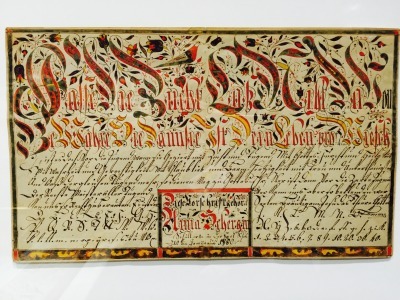 Fraktur is a fractured form of fanciful artistic writing used to commemorate births, baptisms, certificates of merit, bookplates, and documents. Germans brought this tradition with them to Pennsylvania in 1683 and it became a popular means of decorative artistic expression with the common folk as well as the sophisticated. The skill displayed by some of the master fraktur artists rival fine illuminated manuscripts.